In the cases we’ve highlighted so far on this blog, one type of railway worker has been absent: the workshop or factory employee. These were the workers who were employed in the locomotive, carriage and wagon works at the hearts of many of the systems – Derby, Crewe, York, Eastleigh, Gorton, Swindon, Cowlairs and the like. Together they were home to many tens of thousands of men, and hundreds if not thousands of women. At these locations they made fairly much anything the railway companies needed: from the smallest items like nuts, bolts, pencils and buttons, to signalling and rolling stock. This involved all sorts of skilled work – and heavy industrial work. 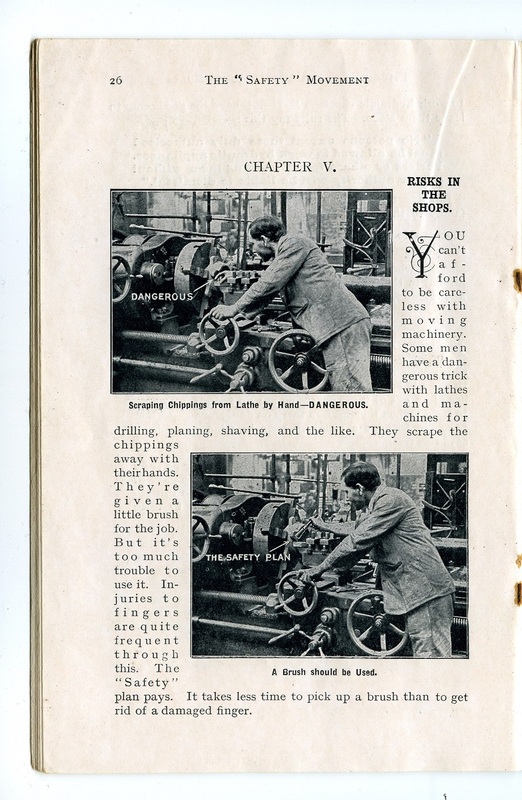 Workshop risks, as discussed in the GWR’s 1914 ‘Safety Movement’ booklet. With this work came exposure to the dangers associated with working in factories – particularly from moving machinery. Yet factory workers, you may notice, are absent from our project spreadsheet. This doesn’t mean they were spectacularly safe, sadly. It reflects one of the oddities about the ways in which railway worker accidents were handled officially. All accidents to railway workers had to be reported (following an Act of Parliament of 1871). However, there was a split jurisdiction. Most accidents were reported to the Board of Trade, through the Railway Inspectorate; the exception was cases which took place inside railway factories, which were (following older legislation) reported to the Factory Inspectorate of the Home Office. In practical terms what this means is we’ve got relatively good information about cases which were reported to the Railway Inspectors, via their statistical reports and investigations. Unfortunately, the figures (and any investigations) for workers inside railway factories were lumped together with figures for other factories, and it’s now impossible to know which of the accidents happened in connection with railway work, and which as a result of other industries (like textiles or manufacturing). All this means that all our details of how many railway workers were killed or injured are an underestimate – the true figure is likely to be rather higher. And it also means that at the moment we don’t have a good means of understanding accidents to workshop and factory railway workers. We’re keen to hear from anyone who might be able to help with this, though, so do get in touch if you have any ideas! Having said all this, if you explore the spreadsheet (under the ‘type of accident’ column), you will find some records listed under ‘workshop’. Looking at them, the common theme is that they all take place in areas like loco sheds, and involve cases relating to operation or movement of stock. They include things like crush injuries between vehicles or in the motion of engines, or being struck by engines around the sheds or whilst repairing wagons. Whilst the location is more like a workshop (under a technical definition of the time), these cases are still to do with operation, rather than, say, machine tools or foundry work (which might be considered more ‘workshop’ in nature). Clearly the boundary between the Board of Trade and Home Office jurisdictions was flexible in these cases, making the picture more confusing for us in 2017!